I have watched fireworks at LEAST once a year, since the year I was born. With that said I thought I had already seen the most impressive fireworks and I believed that there was not much else that would amaze me. I was proved wrong on Thursday. As part of the Bastille Day celebration my friends and I watched the amazing fireworks display at the Eiffel Tower. We were at perfect location where there were other people our age sitting down on the grass playing music and having a blast. It was one of my favorite moments in Paris. I looked around and realized how carefree it looks to be a young adult. Even going out later on that weekend I realized how much of the young adults opted for chill nights hanging out with their friends outside instead of clubbing or going to the bar. The fireworks were the perfect ending to a fantastic day. However, as soon as we got up to go home I was bombarded with multiple text messages and missed phone calls from my parents back at home. This was the first time we found out about the terrorist attacks that occurred in Nice. We were nervous and anxious after hearing the news especially since we were in the same country where it happened. It was only a few hours before that occurred where I mentioned to my roommates how happy the French were today and how much pride they had for their country. This news definitely changed the mood going home. The next day I was curious to see how everyone would react to the attacks the next day. The country was in mourning but there was also an even bigger burst of pride. I saw many people wearing french flag paints on their cheeks, and street and metro performers placed signs in front of their set up that pointed out reiterated the fact that terrorism will not bring their country down. Little things like this helped lift the mood and put a smile on everyone’s face. On Saturday we visited Versailles which I dubbed my new home. To say that it was magnificent is the biggest understatement. It’s hard to describe how regal and grand Versailles actually is. As soon as we arrived the first thing we noticed was the rich gold that adorned the gates and parts of the front of the castle. We made our way through the gardens first which was basically the size of an entire village or city. We visited Marie Antoinette’s house where we learned that she had her own home because she was not that into Louis 16th (her husband). After spending almost three hours touring the gardens we made our way back to the castle to stand in the hour long line to get inside. As soon as we made it in we were like cattle walking from room to room. There was so many people which detracted much of the enjoyment, but it was an incredible exhibit. 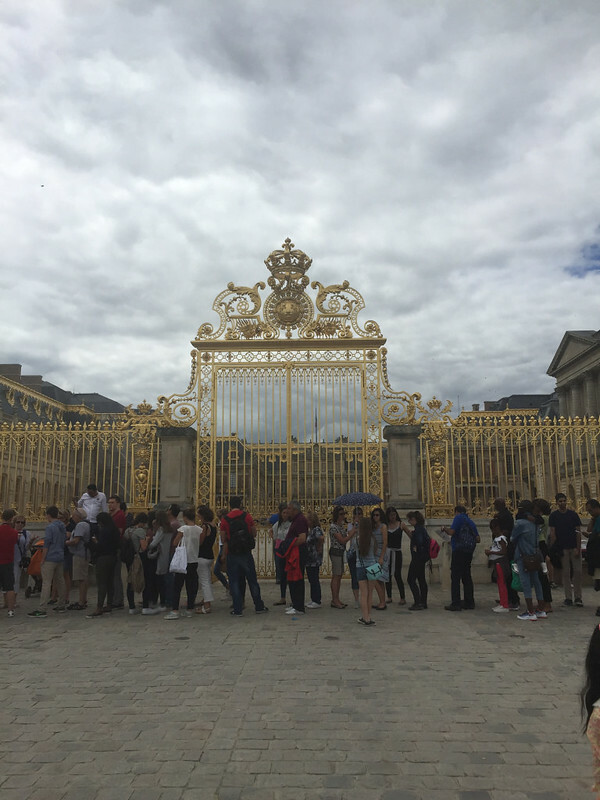 If I had one place I’d recommend to see in Paris it would be Versailles…no hesitation. Last week was definitely a great week with less classes and more time to explore. It was great to be able to celebrate Bastille Day and the holiday weekend in Paris with the Parisians. It is sad that such a great holiday was ruined by the senseless acts of terrorists. However, one thing I learned was that France is a strong country with citizens that stand together. Although I am not a native born French citizen I felt proud of France. My thoughts and prayers go out to all the victims of the attacks in Nice.